Here we will continue list upcoming activities. We'll update this page frequently, so it's a good idea to check back often. Director of the Afro-American History Program at the New Jersey State Historical Commission and author of the book, "Afro-Americans in New Jersey"
Even as it remains one of the nation's most noble episodes of interracial cooperation, the Underground Railroad has become the subject of an amazing number of distortions and misrepresentations, according to Giles R. Wright, New Jersey's top authority on the region's black history. is determined to set that record straight! Director of the Afro-American History Program at the state Historical Commission in Trenton and author of the book, Afro-Americans in New Jersey, Mr. Wright is currently conducting the most extensive study ever done on underground railroad activities. The Historical Commission is soliciting information from anyone who believes they know of local sites or the identities of persons who participated in underground railroad activities. Each reported item is then investigated and evaluated in a manner that has, in effect, made Wright the state's official underground railroad myth-buster. Funded by a special grant from the legislature, the project aims to produce a definitive, accurate history of the runaway slaves who passed through New Jersey and the people who helped them. The ongoing work is documenting new information, at the same time it exposes some underground railroad site claims as fakes. "There is is no aspect of black American history that is more popular -- or more shrouded in misrepresentation, speculation, fabrication and myth," Wright says. He also notes that this sort of historical research can be unpopular. "People at the local level who claim their spaces are underground railroad sites don't want to believe otherwise; even if we come in and provide evidence disproving that, they are quite reluctant to accept it," he says. One of the more outrageous underground railroad claims he recently debunked involved a bar owner in central New Jersey. According to Giles, the man was attempting to inflate the value of a property he was trying to sell by suggesting it has great historical signifigance. "I'd never seen anything like this," Giles says. "Down in the basement was a little shrine of candles, three six packs and an image of a black Jesus. The walls had been knocked out between crawl spaces and white Chritmas lights had been strung as far as you could see in the darkness. A printed handout said something like 'Through these portals thousands have passed'. And there was a water cooler bottle set up for collecting donations." On the other hand, Giles' research is confirming and broadening our understanding of authentic New Jersey events related to the underground railroad, including armed showdowns between runaway slaves and slave catchers. One such confrontation occurred in December, 1860, in Timbuctoo, a small settlement established by freed slaves near Mount Holly in Burlington County. "A slave catcher out of Camden came into Timbuctoo attempting to apprehend a runaway slave who had lived there for ten years," says Giles. "The members of that community, being armed, rose up to prevent the slave catcher from apprehending the fugitive slave and returning him to the South." "This incident," he continues, "underscores why these all-black settlements are of particular importance as havens that provided runaway slaves with a great deal of safety." 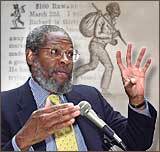 Perhaps the biggest myth about the underground railroad has to do with its size, said Giles. Most people believe that "large numbers" of fugitive slaves traveled through the secret network. "Nothing could be further from the truth," he says. "Slaves who ran away and came north constituted a very small percentage of the overall number of slaves who ran away. Most runaways stayed in the South and did not come north. That is why we can discount a lot of the claims that have been made about the underground railroad -- because we have almost more claimed sites than we have slaves." During the approximately 31 years of the nineteenth century that the underground railroad operated, 30,000 to 50,000 slaves are estimated to have passed through it, Giles says. This was at a time when there were a total of about 4 million slaves throughout the United States. This means that barely one percent of all slaves escaped to the North. The government historian also pointed out that new underground railroad myths continue to spring up and often go unchallenged by newspapers and broadcast outlets that parrot publishers' news releases as historic fact. In this regard, he was particularly critical of the 1999 Doubleday book, "Hidden in Plain View: A Secret Story of Quilts and the Underground Railroad", by Jacqueline L. Tobin, Raymond G. Dobard and Cuesta Ray Benberry. The book suggests that slaves had a well-coordinated secret code system that used quilts to "publish" information about how to escape and flee to the North. In its carefully worded review, The New York Times characterized the book as a "fascinating theory." Giles believes that the book, "Hidden in Plain View" is "sheer conjecture and speculation" that "greatly misrepresents" black history. "This book is selling like hotcakes," he says, "because it presents a very, very appealing idea. But it is nonsense and a perfect example of what those of us who are attempting to do serious underground railroad research are up against." Be Sure to Attend Our Closing Reception and this unique opportunity to hear Mr. Giles R. Wright Speak about his Research on the Underground Railroad in New Jersey. This Page is Continuously Under Construction.